I decided to do a direct comparison of the 3 Strathmore Visual Journals by doing a sketch in pencil, then ink, and finally reasonably wet watercolor painting. See my previous post for information about why I am using these instead of my usual daily handbound watercolor journals. I will tag each of these entries in the "Strathmore" category on the right sidebar. Here are the current 3 pages for comparison - all drawings were done at the same time, then ink was added to all at the same time, and then they were painted. I painted the figures, going down the line. After they dried, I painted all of the borders. After they dried, I tried glazing with the complementary color and scrubbing with a stiff brush. In reality I probably only waited 5-10 minutes between painting the layers. Conclusion: The different paper types were more similar than different in this direct comparison with pen, ink, and watercolors. Each of the pages buckled a little as it dried, but as soon as they were dry, I scanned them (not more than 1 hour later) and there were no shadows from the buckling. And this morning, the pages are flatter. The glazing looked similar on each, and I was able to lift a little paint from each page with a stiff brush, and with only a little roughing up of the paper. I like to use both sides of my 140 lb watercolor paper, so next I need to test these pages further by painting on the other side. I've worked on a few other pages in each journal and after I've done a few more, I'll post the results for a single journal, one by one, showing the various ways I tested my tools in that journal. 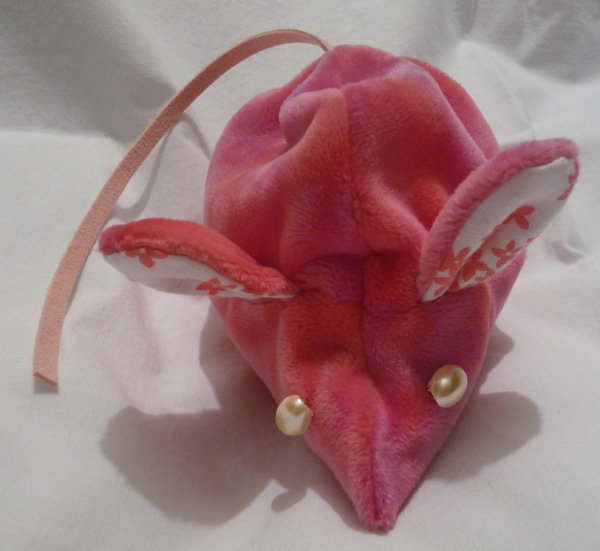 Several years ago, I posted photos and journal pages about Rice Mice that I made for Christmas decorations and for my grand children's stockings. 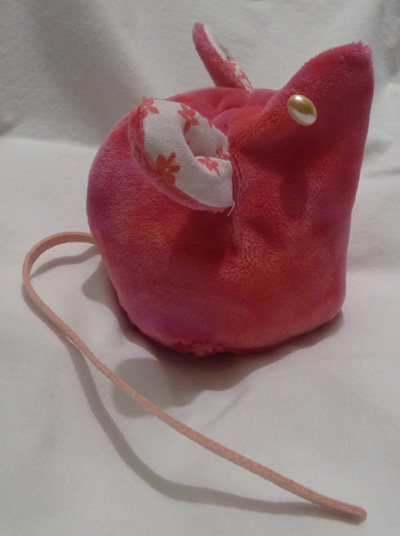 Most of the important information about the origin of these handmade toys and my love of them is in that blog post and very important to the rest of the story. I had so many requests for information about where to buy the book, that I contacted Dr. Sam Refetoff and met with him and his current wife Heather when they were visiting New York City and plans began to update and publish a new edition of the book. Heather worked with Ann Goodman Hayes, one of the original co-authors, and I closely followed the progress of the project. The 2nd Edition is now available. 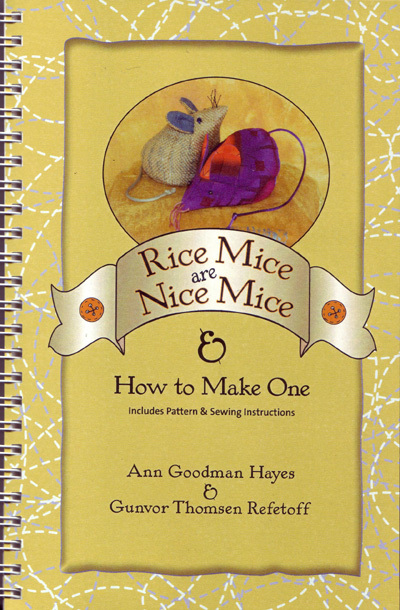 I read all of the poems in the book to my grand children, ages 3, 5, and 7, this weekend over breakfast and once again needed to make a Rouse Mouse - singular of Rice Mice. 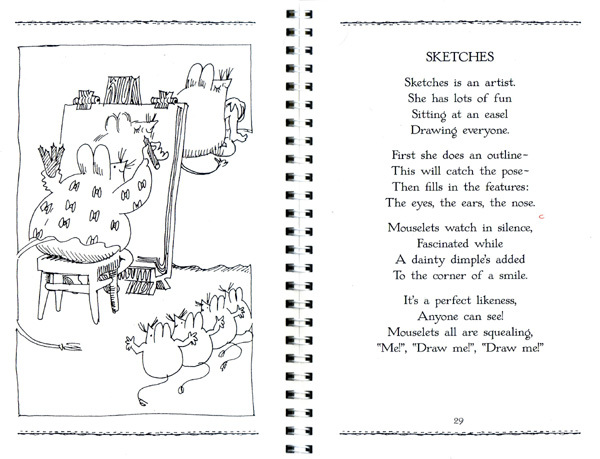 There are new poems in this edition and lovely line drawings. Here is one I thought was appropriate for this blog. 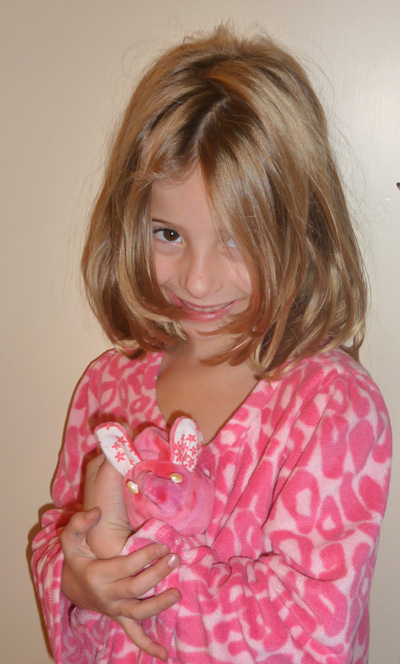 And here is happy Sydney, still in her nightgown this morning, with her new mouse. She selected the fabric, buttons, and tail from my plentiful stash and then worked with me right up to the point where we added the rice. And here are the photos of the furry little creature. I was the lucky recipient of 3 of the new Strathmore Visual Journals from Rice Freeman-Zachary, and I promised that I would use them and share my comments. 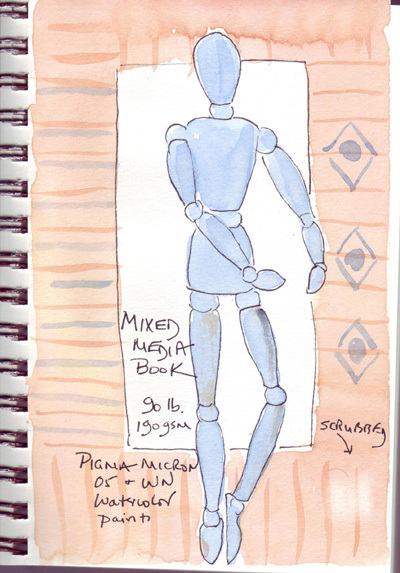 These are very nicely sized books (5.5 X 8 inches) - not too big for purses, backpacks etc and not too small for those of us that like generous sized pages for their daily sketches. They have a thin first page with information about the journal which can be ripped off revealing a plain, sturdy brown front cover that is aesthetically more pleasing if you will keep the journals. Both front and back covers are very sturdy and make it very easy to sketch and paint in the books without other support. However, they are spiral - which means you need to learn to deal with the metal when drawing close to the edge of the page. And it may be tempting to remove pages that you don't like. My first 7 daily journals were very similar in format - but with thinner covers and paper. I had problems working freely in journals that felt too precious and wrote essays about "journal angst." 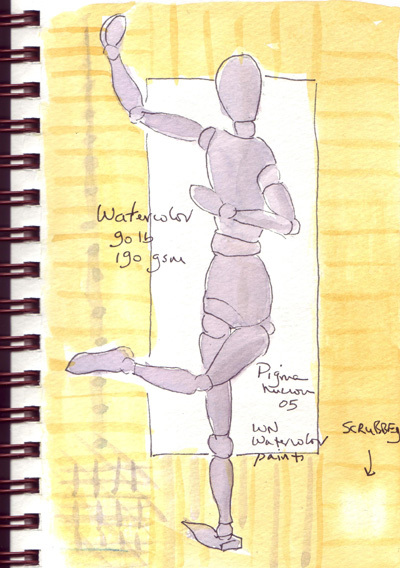 These sketchbooks would be good for beginners and for anyone suffering from similar angst. 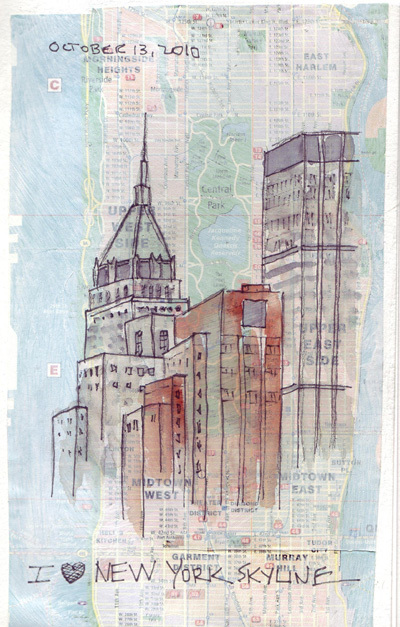 Yesterday I followed Jane LaFazio's tutorial on mixed media journal pages - gluing on a map of Manhattan, then lightly painting the glossy map with Golden absorbent ground and then drawing and painting with pigma micron pens and watercolor washes. 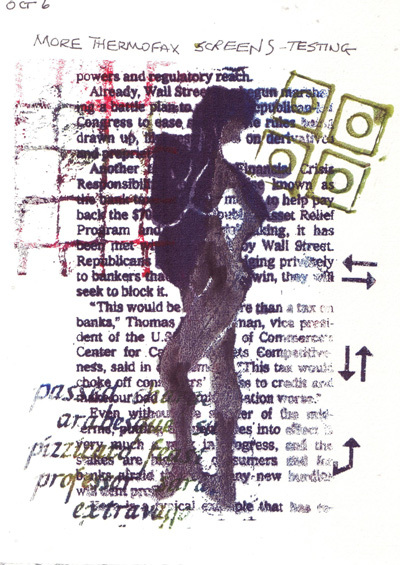 The paper in this 90lb Strathmore Mixed-Media Visual Journal buckled a little, but I was able to scan it without scanner shadows from paper buckling. 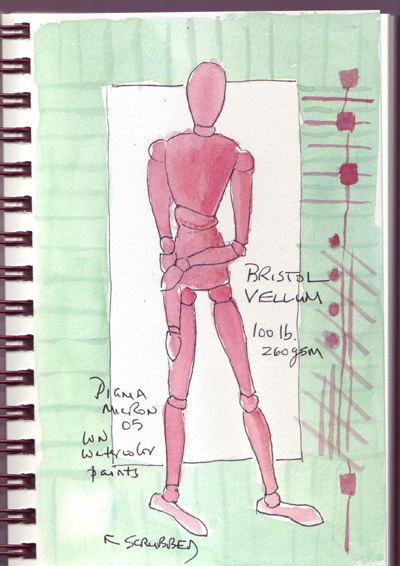 I will periodically upload pages that I do in the 2 other Strathmore Visual Journals - the 90 lb watercolor journal and the 100 lb Bristol-vellum journal. I already have 3 pages done in each and love the playful attitude that I have about using them. I still love my handbound, cased-in, watercolor journals with 140 lb watercolor paper, especially now that I am also dying fabric for the book cloth. But these Strathmore journals are really easy to pick up and use when you just want to experiment and draw/paint something. The Central Park Sketching and Art Meetup Group went to Tudor City, in Manhattan, this weekend. It is a lovely apartment complex with quiet parks embedded among the buildings, and it overlooks the United Nations Plaza. 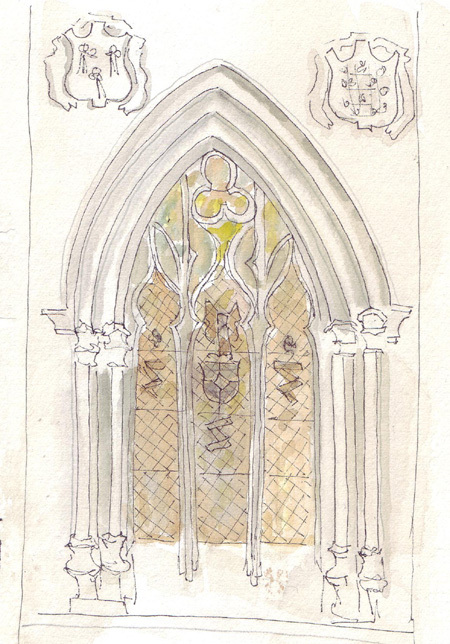 Here are the two sketches that I did while we were there. The Tudor buildings have wonderful architecture and I was captivated by this stained glass window, with gold lights shining through. 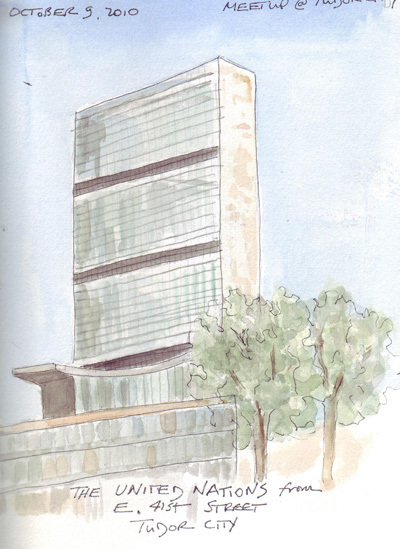 For our second sketch session, my friend Benedicte and I sat on a bench overlooking the UN Plaza and sketched the buildings. The group will next sketch in Battery Park, another place in the City that I don't know very well. I took a class with 2 of my art buddies this week, in which we learned how to make Thermofax screens that can then be used to transfer images to paper or fabric (with fabric paints or thickened procion MX dyes). You can see details of our day here in Rayna Gillman's blog and a humorous recounting of the day in my friend Pat Gaignat's blog. I'm the one in the gray shirts in these photos. I took lots of black and white images with me to make screens, but I was most interested in getting screens with images of my pregnant model from figure drawing. I also made screens from designs that I can use for background surface design, screens from some of my stamps, and screens from photos I took of Manhattan. While in class I tested some of the screens with Profab paints in my watercolor sketchbook and on fabric - and couldn't wait to go home and try printing with thickened dye on fabric for quilt journal page #6. Here are the 3 journal pages that I made - very quickly and with very little thought. But it gives you some idea of the images I can now print.